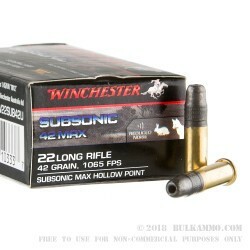 Looking for a .22 that won’t scare off varmints on your next hunt? 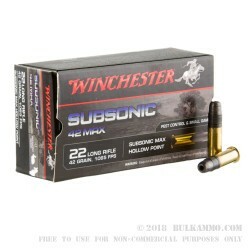 Winchester’s Subsonic 42-grain lead hollow point provides a high velocity .22 long rifle round, in a reduced noise package. This is not only beneficial for reduced noise for the hunter, but is also great for skittish prey, or backyard pests in areas where noise may be an issue. Coupled with a suppressor, these rounds can be highly effective, with just the sound of the bolt being audible. Capable of a muzzle velocity of 1065 FPS, these rounds are highly accurate and have no problem penetrating hide on smaller animals. 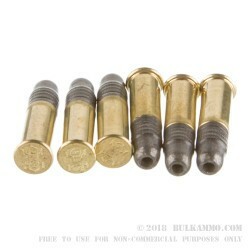 The hollow point design allows for good penetration and expansion, taking out squirrels, rabbits and other prey quickly. 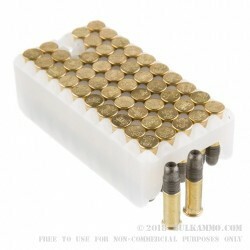 These 50 round boxes of .22 LR rounds are made with rimfire primed, noncorrosive, factory rolled brass cases and are loaded with a 42-grain lead hollow point bullet. Q: How well does this ammo shoot out of a semi-auto? A: Hello Robert, This ammunition is designed to be used in conjunction with a suppressor. Without a suppressor, most semi-automatic handguns will not be able to reliably cycle this lower velocity ammunition.